"Pull yourself together, Lander. You are twenty-two years old. You are in trouble, and you aren't going anywhere. The facts are grim. Talk to me." Lander' entire life is about freedom. She has always gone anywhere. To the top of the class. To the mall. To Europe. To ski resorts. She tries not to be a crybaby, but the only thing she wants to do is fling herself facedown on her own bed and bawl, something she has not done since middle school. She swallows hard and finds her voice. "Can my parents be here while I talk to you?" The lawyer stares incredulously. "I've heard of helicopter parents, how they go to college interviews with their children. How they even show up at the kid's job interviews. But they don't share jail, Lander. You got prison term, it's your prison term." Nobody is saying that Lander is innocent. Not even their own parents. Not Jack. Not Stu. Wait. Geoffrey is. Why is Geoffrey sure? Why am I sure? What do the rest of them know about my sister that they think she really could kill somebody? 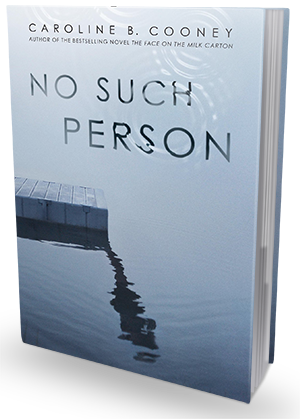 Set against the backdrop of a Connecticut River summer town, Caroline B. Cooney's latest novel, No Such Person, makes for an intensely captivating, thoroughly unsettling and absolutely unputdownable murder mystery with elements of psychological thriller. Cooney is a veteran. Her critically acclaimed The Face on The Milk Cartoon series has been a big HUGE hit. I myself haven't read it yet, but it is definitely one of the series I know I want to get to very soon. I have heard enough about it, though, to know that this author is incredibly talented and skilled at what she does. See, Cooney writes insanely good thrillers. And if you happen to like those, then No Such Person is absolutely not to be missed. It all starts with a water-skiing accident in which one boy (Derry) almost loses his life. He survives, narrowly escaping death by drowning, but ends up hospitalized. The accident is witnessed by 22 year old Lander, her 15 year old sister, Miranda, their parents, and many other vacationers and locals living on the riverfront. Miranda thinks she saw something odd and very disturbing just before the boy got pulled under a huge river barge. She thinks she saw his friend purposefully slow down the motorboat, causing the skier to lose his balance and topple over. She shares her observation with her older sister, but Lander is - as always - dismissive and annoyed. She does not believe Miranda's claims for a second. 7 days later, Lander is found on a boat loaded with drugs, with a gun in her hand and a dead body close-by. "There isn't money for Miranda to go to college. There never was, even without attorney's bills. Either her parents tell themselves that somehow they'll make it work for daughter number two, or they shrug about daughter number two. In every way, Lander is always daughter number one." Lander is often referred to as "one of the smartest people (everyone) knows", but looking at all the horrible decisions she's made, and at her really poor, poor judgement, I completely do not understand where this label comes from. To me, she seemed sheltered, protected and spoiled. She never truly had to work for anything. Everything - from school tuition, to piano lessons, expensive trips to Europe and vacations at ski resorts - was pretty much handed to her on a golden plate. Moreover, she didn't even seem grateful or appreciative of any of it. Early on in the book, when we get to see Miranda and Lander interact with each other, it is pretty clear that Lander feels very entitled, very clever and way above everyone else around her - even her parents, and especially her younger sister. Everyone tip-toes around Lander. People do everything they can to make sure Lander is happy. No one ever questions her, no one dares disagree with her, let alone ever criticize her. In a way, I felt a perverse kind of satisfaction when Lander's world collapsed in on itself, because I felt that she kind of deserved it. She really needed to learn a lesson. And she was too self-absorbed to see all the warning signs. I disliked Lander. People like her - overprotected, privileged poster children - live in glass houses. And it really doesn't take much to shatter those to pieces. Miranda was an interesting character. Even though I don't have siblings myself, I was able to empathize with her and really feel everything she felt. The frustration, the disappointment, the feeling of never being good enough, etc. Cooney did a fantastic job portraying both sisters and fleshing out the dynamics of their relationship. I found myself completely immersed in their story and emotionally invested in the events. Plot wise, the book was really superb. Cooney really knows how to plot a good murder mystery. No Such Person is an edge-of-your-seat kind of read - fast paced, entertaining and gripping. Towards the second half of the book, I began suspecting who was behind the murder, so the big reveal didn't really surprise me at all. However, I still think it was a cleverly plotted and supremely readable book. If you like murder mysteries with elements of family drama, you are guaranteed to enjoy this one a lot. I would definitely recommend picking it up!